From Scarborough Bridge we proceed to another place where input is being encouraged on plans for future development. The previous imaginary journey was on foot/two wheels. For this one, as we’re already by the river, let’s board an imaginary boat, and glide gently and sedately along the Ouse. It’s not far. On our way to a small riverside park, we pass other riverside parks, the Museum Gardens on the left, the Memorial Gardens on the right, go under a couple of bridges (Lendal, Ouse) — with North Street Gardens on the river bank between them — and then just before the next impressive city bridge (Skeldergate) we disembark at Tower Gardens, opposite the Bonding Warehouse. We’re at one edge of the ‘Castle Gateway’ area, discussed in an earlier page on the recent history of the area around Clifford’s Tower. Having included all those links to other pages of mine I have to send you off to another website: My Castle Gateway. A collaboration between My Future York and City of York Council, it’s a fresh and interesting and invigorating approach to gathering ideas for this important area of the city. In this, as in all things, I’m an independent and impartial observer, but I think I know a good thing when I see it, and My Castle Gateway seems like a very Good Thing. Interviews on the project’s YouTube channel include a video in which Philip Crowe suggests the felling of trees here in Tower Gardens to let in more light. A controversial idea, and one this self-confessed tree-hugger disagrees with, so a good place for me to start approaching the Castle Gateway project. Before attempting to tackle that issue, and sharing with you some photos of the park taken recently, a bit of history has to feature. I wanted to focus on the park known as Tower Gardens in terms of its present and its future, as that’s what the My Castle Gateway consultation is about. But I couldn’t help wondering what people had said about the place in the past, when it was new, and over the decades since. This led to the discovery that Tower Gardens seems to be quite a recent name. Old postcards like this one and this one call it ‘St George’s Park’. In the official York guides I have from the 1970s to the early 1980s it’s referred to as St George’s Gardens. 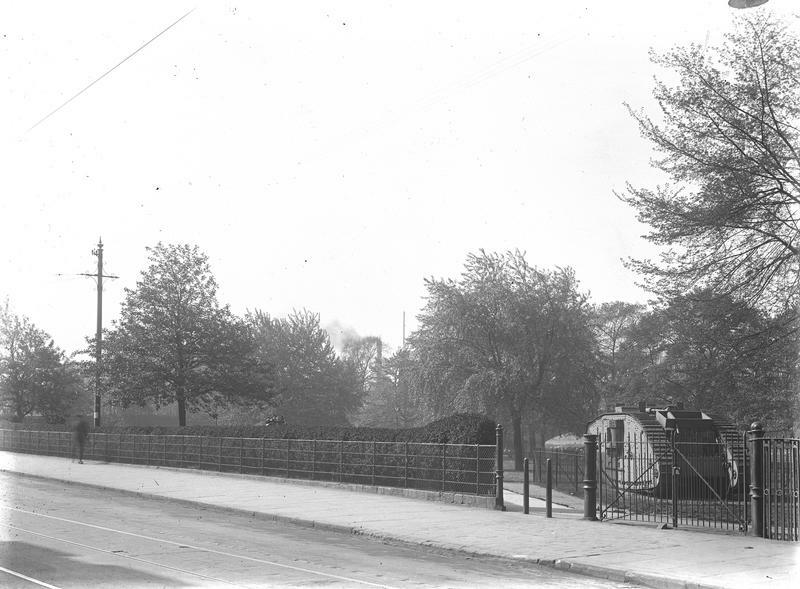 When did the name change to ‘Tower Gardens’, and why? The earlier name recognised that it was part of St George’s Field (called St George’s Close in some older documents). 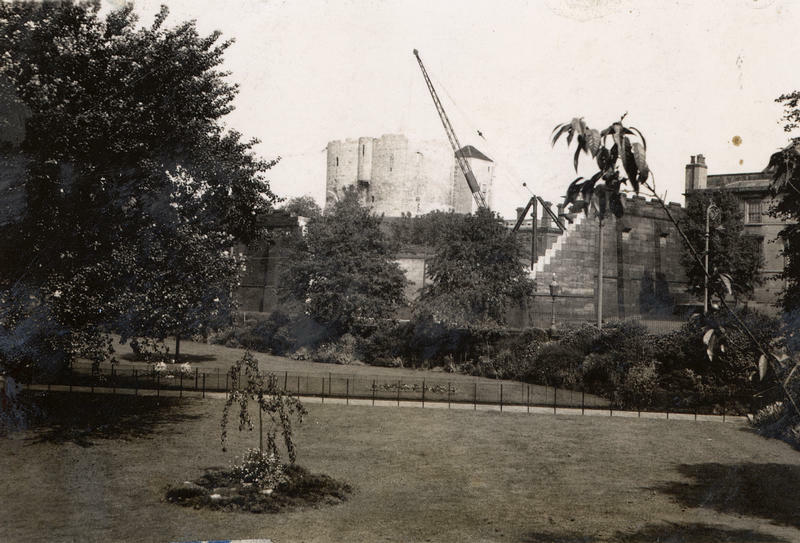 Here’s Tower Gardens/St George’s Park/St George’s Gardens in the 1930s. 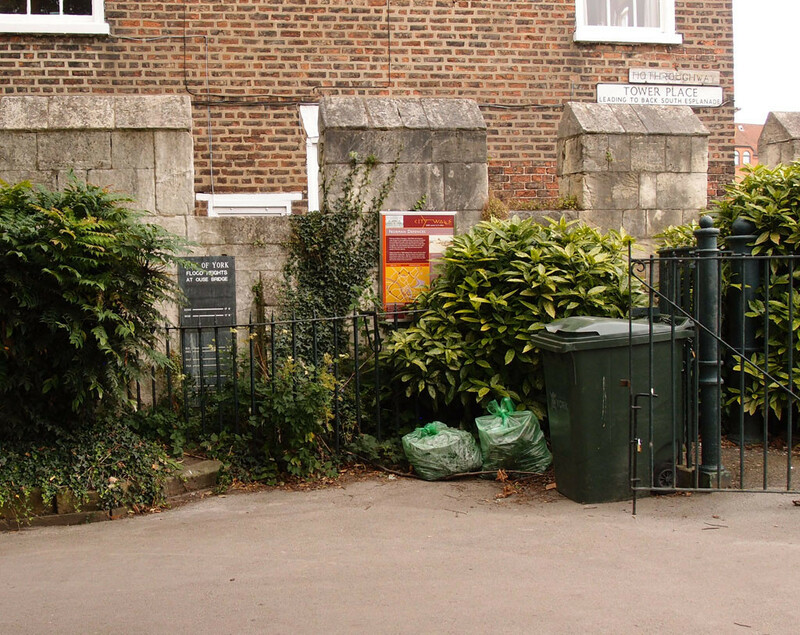 … St. George’s Field, which has belonged to the citizens of York from time immemorial. Here every citizen had, and probably has still, the right to “walk, shoot with bow and arrows, and to dry linen”. I have often done the first, and probably some day the urge to do the others will prove irresistible. When Skeldergate Bridge was built in the late nineteenth century its landing on this side of the river took away some of ‘our’ field. Perhaps no one minded at the time, wowed and dazzled by the new bridge. Important to note though that the place we now call Tower Gardens, a small area of St George’s Field/Close, used to have a name resonant with these historical associations, reminding us of that ancient field/close. 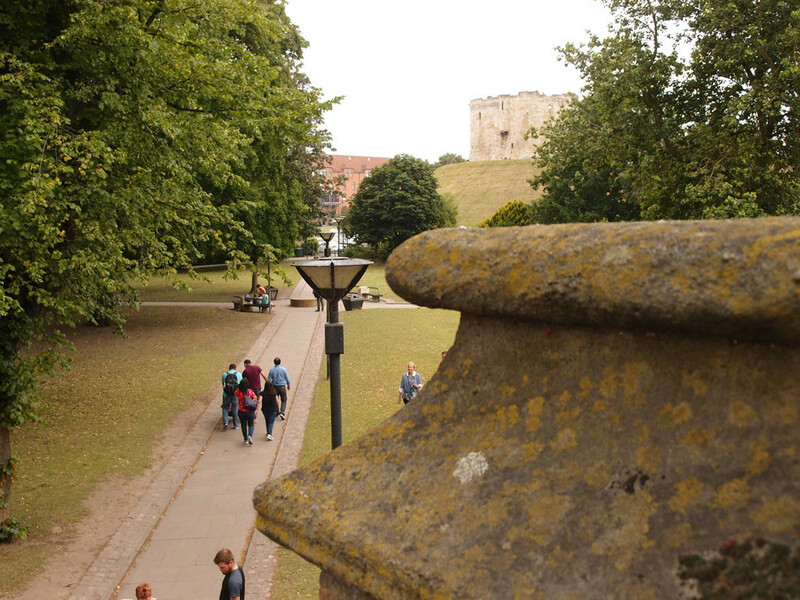 The present name links it to Clifford’s Tower — one of the city’s main visitor attractions. An interesting change of emphasis, I thought. There are many places in the city that, if you’re asked to think about them critically, you might find many faults with, find they don’t quite work as they might, as you’d like them to, in an ideal world. Tower Gardens is perhaps one of those. Tower Gardens is somewhere I’ve tended to walk through, across, rather than stay. This seems a common experience, and its diagonal paths cutting across the space acknowledge that this is what most people do. It seems from the old photographs that the diagonal paths across it have always been there. So it’s a place to pass through. Is there much reason to stay? The café here, in the charming toll house/motor house building at the edge of Skeldergate Bridge, seems popular. There’s one pretty area of flower in the corner near South Esplanade. I looked around for other things of interest. There’s a rather grubby concrete plinth with a metal plaque on top of it explaining some of the history of the New Walk, which starts here. 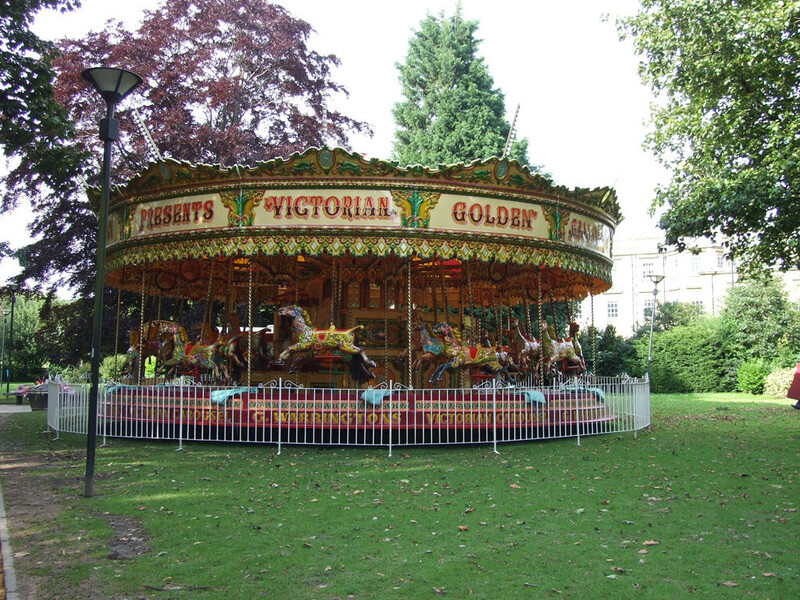 Looking through some old photos I took ten years ago, in July 2007, I was reminded that Warrington’s carousel was in the gardens back then. It seems to be at the Eye of York instead now. At least one tree has been removed since the photo above was taken. In 2017 there aren’t many trees in the area nearest to Tower Street, but there are a lot near to the riverside. Some of them on the line of the centuries-old New Walk, which continues on through the riverside walkway arch of the Skeldergate Bridge approach. As mentioned above, Philip Crowe thinks the gardens would be better if some of these trees were felled. Is he right? If so, which ones? The thick-trunked very mature ones (casting the most shade) or the young ones? If so, who decides which ones are for the chop? They all seem in robust health. Looking at it from various angles, how is felling of healthy town centre trees justified? Some of the comments on Post-it notes gathered for My Castle Gateway refer to ‘moving’ the trees. They’re too big to move. They’d have to be sawn to bits with chainsaws. Mature trees in city centres are precious, for many reasons, and should be treated as such. If grass doesn’t grow under them then perhaps it would be more sensible to give up on the grass. There’s grass all over the place, it’s so common we barely notice it, and most of it we appear to have no desire to sit on. Just a thought, but maybe people would linger here longer if it looked like it was a cared-for place and if they didn’t have to sit on the grass/earth, if there were more benches? Is that too detailed/small-minded/boring an idea? The benches here, or rather the lack of them, seems a fundamental factor in its failure to be a place people would stay awhile. There are benches around the circle of paving in the middle, and a group of people were sitting on them while I was there. I recall sitting on them myself once, but the positioning feels strange — basically around the middle bit of a busy pathway with people walking past/through. The more conventional approach of having traditional wooden benches with backs and armrests around the edge of a park — as at the Memorial Gardens — seems to work better in these formal spaces. But then if you’re going to have a formal park it needs to look colourful and tidy and well-maintained. I’ve been quite surprised, on the occasions I’ve been through here, how tatty it looks. I’m all for wildflowers and the like, but some places, these civic spaces intended as formal gardens/parks, need to at least look maintained. It doesn’t need vast swathes of bedding plants. Perhaps we could just look after what’s there a bit better? The grass under the trees was littered with bits of twig, and apparently goose moulting and goose droppings are a problem too. At least these rot down fairly easily and naturally, unlike the human-created waste sitting in bins and plastic bags by the gate, in front of the plaque indicating the height of various floods and an information board I doubt very few people read. The fact that the park floods frequently does of course mean the planting has to be of things that can cope with those conditions. Nearby, on the other side of the gate, barely visible as it’s grubby and bent and lost in leaf litter, is a metal marker. 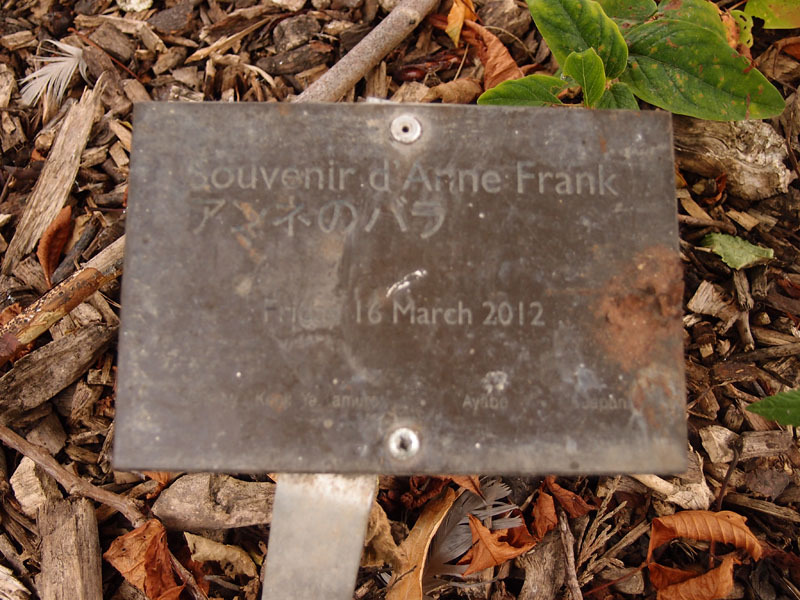 I’ve seen this referred to as a memorial to Anne Frank, but it’s not just that, it’s marking the location of what used to be a rose, donated to the city (see York children attend Souvenir d’Anne Frank rose planting ceremony — York Press, 17/03/2012 and these photos on Flickr). I wonder if anyone recalls seeing it in bloom or knows what happened to it. There’s no rose there now. A letter to the York Press suggests it had died by the following year (Find another way, 27 June 2013). But the trees are thriving. The suggestion that the healthiest and most vigorous things in the park should be removed strikes me as hard to justify. Places work when we work with what’s there. Perhaps before imposing our ‘visions’/dreams on the place we should first work on understanding what we already have, and why. And perhaps that will make us value it more. The sad demise of the Anne Frank Rose is a reminder of how things usually work — we embrace the new, appreciate the event of a commemorative planting, but perhaps forget the rather less glamorous tending and maintaining of what’s there already. Apparently this is one of the places blighted by geese, according to those people who have problems with geese. Having walked round the periphery of Tower Gardens and then through it, taking photos and looking carefully and noting its details and trying to tune in to its charms, I have to say that the highlight of the visit was the family of geese wandering up to me as I stopped for a while on the nearby riverside path. As discussed previously, the Arts Barge could soon be moored here on the Ouse at Tower Gardens. 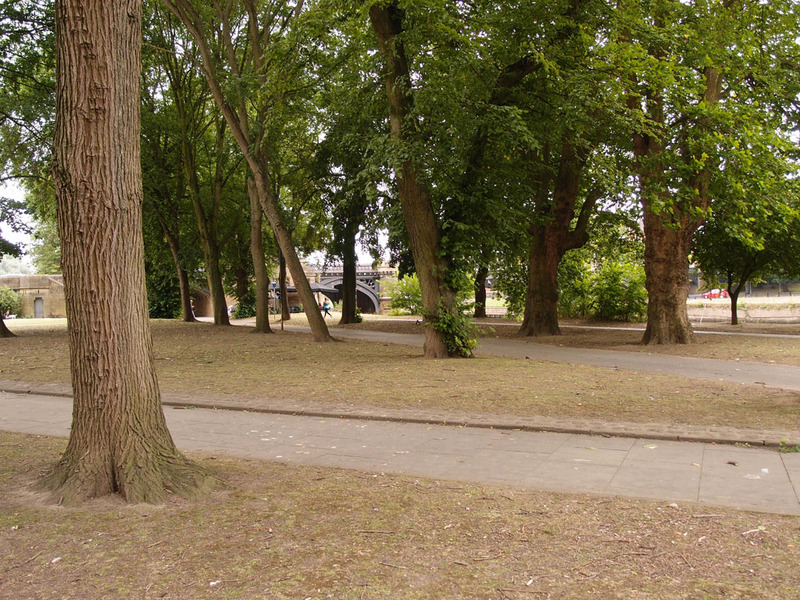 Obviously that permanent mooring would change the place, giving a new focus to a small area that it at present trying to be an old-style municipal park and failing as that. Maybe we should see how that works out before chopping trees down. As usual, all the opinions expressed are merely my own observations and thoughts. If it has prompted your own thoughts, dear readers, please see the links below for more information. The My Castle Gateway consultation asks what we’d like to see/do in the various parts of the area under consideration. Here, in Tower Gardens, it looks quite simple to me: perhaps a few benches round the side, some more flood-resistant planting, and more tending of it on a more regular basis? But if it’s a bit of a let-down at present let’s not blame it on the trees. 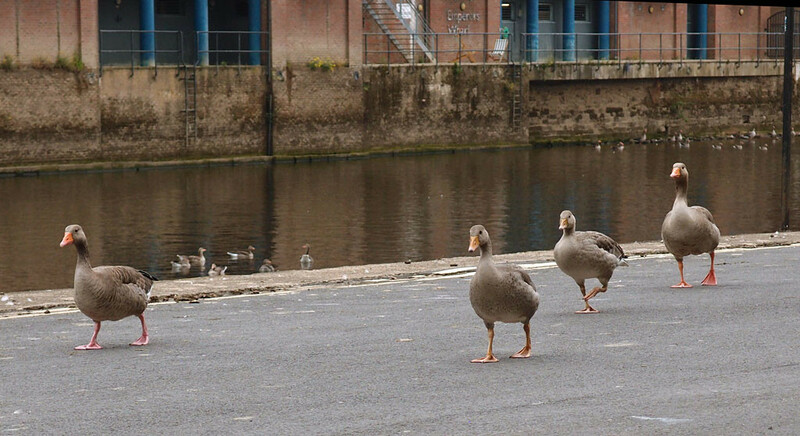 Or the geese. As I think the My Castle Gateway consultation is an important and thought-provoking thing I’m planning to add a few more pages on the bits of the area I’m particularly interested in over the next week/fortnight. Please call back soon if you’re interested in this area of York. But if you appreciate the care and attention that goes in to creating quality online content then virtual coffees are always appreciated. The previous ‘coffee money’ actually bought not coffees, but books, including a secondhand copy of the lovely C B Knight book quoted above, and another one on the river Foss and its history. More on that story later. Thanks for your support of this resident’s record of York and its changes. I still remember going to the St Georges Field swimming baths with my school though cant recall if it was Westfield or Acomb Secondary Modern . Victorian and very cold with very slippery floors ! Yearsley baths , now your talking Stephen. My granny and aunts and uncles lived in Kitchener Street , very close. I used to go and stay with my big cousin Pat Sanderson there in the holidays and her father took us swimming every morning. It was so good to swim in the open air and the changing booths at the side were always clean with top openings so you could look out at the activity in the pool. I think the water was also fairly warm . Is it still there or like so much to do with the factory lost in time ? On the subject of St George’s Swimming Baths, near the Castle,and Yearsley Baths at the opposite city location,must agree it was the better of the two.My school class pal also lived at 2 Kitchener St,which I visited often,most times for the both of us to go swimming thence,and in later teenage years to dance at Rowntree Youth club dances,and join in JR THEATRE events,both on,and back stage.Unlike the old Rowntree factory, those baths are still very much alive,thanks to york council’s efforts,prodded quite significantly by public demand,and probably still well used by local people. I’m sure we all remember the “icebox” that most of the schools had to use as a changing room as the box changing areas were used by the paying public. A shortish walk from Scarcroft Junior in the late 50’s under the watchful eye of the gregarious Head Teacher,Miss Tomlinson, saw me swim my first length in the round bath and receive my bronze medal. As I got older it was York City Baths club on a Tuesday and Thursday night with a steaming cup of machine made cocoa for 3d afterwards and, if the Fair was in town, a walk round the stalls trying to win a coconut. I did win “Sammy,” my pet goldfish though. Teddy boys and drainpipes; beehive hairstyles and flared skirts; the smell of candyfloss and toffee apples; bumper cars and giant swings with a Union Jack and Stars & Stripes pained underneath them; diesel generators and brylcream; roll-a-penny stalls and airguns. Commercial? Absolutely. But more akin to a medieval fair than anything we get in town today. This was what George’s Field was for. The entertainment of the masses. I wouldn’t have missed it for the world. I have happy memories of swimming at St George’s baths as a member of York City Baths Club in the 1960’s. The club’s star swimmers were Ann Barner and Amanda Radnage and we aspired to reach their level when we were older. I used to train there on the way home from Archbishop Holgate’s Grammar School on Hull Road. On alternate Tuesdays I had to miss training to get my brace adjusted at the dentist on Blossom Street ( I think he was called Burdekin). But I still swam about 4 times a week and with my rugby and athletics at school I was fitter than I have ever been since. On one occasion training was called off as River Ouse water had got into the pool apparently because someone had forgotten to close a valve in a pipe which led into the river. I too remember the freezing communal changing room at St George’s. I don’t remember much of the architecture of the place but my recollection was of the place being rather run-down. Yearsley baths were much better-originally open air but roofed over some time in the 60s. There was also an open air pool on the other side of the river which I think was called Rowntree’s Baths but was actually much closer to Terry’s factory. I took part in a York schools swimming gala there. People pronounced it “gay-la” for some reason.